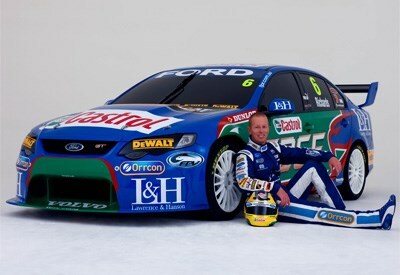 FPR driver Steven Richards is eyeing off the championship crown in 2009, after 13 years of V8 Supercar racing. Ford Performance Racing star Steven Richards has declared 2009 his best chance yet of becoming V8 Supercar champion since his V8 debut 13 years ago. The Melbournian Ford driver starts with a new car and a fresh attitude, encouraged by his round win at Symmons Plains last year. "I race because the competition in this category of motor racing is equal to, if not, the best in the world," Richards told AA. "If you can stand on the top step at the end of the year you know you've achieved something fairly incredible. "This year without doubt is the best opportunity I've had to date to win it. Early on in the championship, the first five rounds, they will tell whether or not there's any reality of that taking place." Richards, 36, is excited about the prospect of racing in a brand new car. "We will have two competitive cars and every year you go in with a clean slate to try to do the most you can," he said. "Each year I've been in the series, particularly the last two years, I've managed to score race wins and podium positions, but it's just about being a little bit more consistent at doing that. "We're really looking forward to the FG. Lining up in a new car, it's like getting a belated Christmas present! The BF for the last two years has been a real work in progress for us, so having effectively 18 months for the FG process, that gives the team a good, clean sheet to make everything right. "I want it as bad as any guy. I've been in the championship now for 12-odd years and it's sort of eluded me."